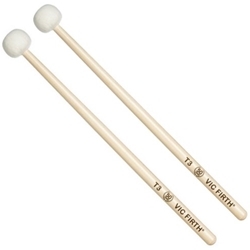 The Vic Firth American Custom T3 Staccato Timpani Mallets are medium hard for rhythmic articulation. Vic Firth American Custom Timpani Mallets are turned from a single piece of rock maple, which eliminates a core that could rattle and the need for a screw-on washer to secure the head. Length: 14 1/2 inches, Head = 1 1/4 inches.